Canada's biggest rock band are hitting the road! 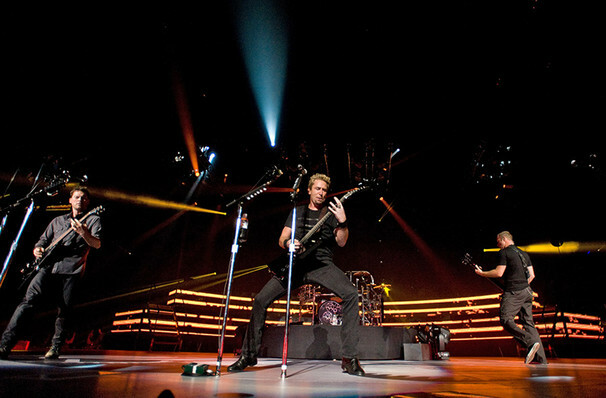 The group are promoting their recent record Feed the Machine, their ninth studio album in all and one which sees the band pushing into heavier territory. Lead single 'Feed the Machine' is a political rallying cry, backed with some of crunchiest riffs we've heard from the boys in a while. Led by Chad Kroeger, Nickelback first came to the world's attention with the single 'How You Remind Me', which would go onto become the most played song of the 2000s on American radio stations. Their brand of catchy post-grunge rock helped establish the band's as genre behemoths, following up the massive success of 'How You Remind Me' with the equally ubiquitous singles 'Photograph' and Rockstar. About Chicago-Theater.com: We are an independent show guide not a venue or show. We sell primary, discount and resale tickets and prices may be above or below face value. Sound good to you? 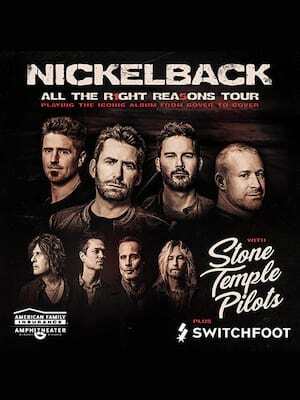 Share this page on social media and let your friends know about Nickelback at Ravinia Pavillion. A Chorus Line is at once a period piece and a brilliantly timeless work of musical theater about talented people who are striving to achieve their dreams - or at least to make a living. Please note: The term Ravinia Pavillion and/or Nickelback as well as all associated graphics, logos, and/or other trademarks, tradenames or copyrights are the property of the Ravinia Pavillion and/or Nickelback and are used herein for factual descriptive purposes only. We are in no way associated with or authorized by the Ravinia Pavillion and/or Nickelback and neither that entity nor any of its affiliates have licensed or endorsed us to sell tickets, goods and or services in conjunction with their events. Chicago-Theater.com is part of the Theatreland Ltd Collection. Established in 2003, Theatreland offers the largest individual collection of websites providing complete, impartial guides to all the theatrical, musical and performance arts events and venues in the world's greatest theatre cities, from New York's Broadway to London's West End and from the showrooms of Las Vegas to Shakespeare's Globe Theatre.